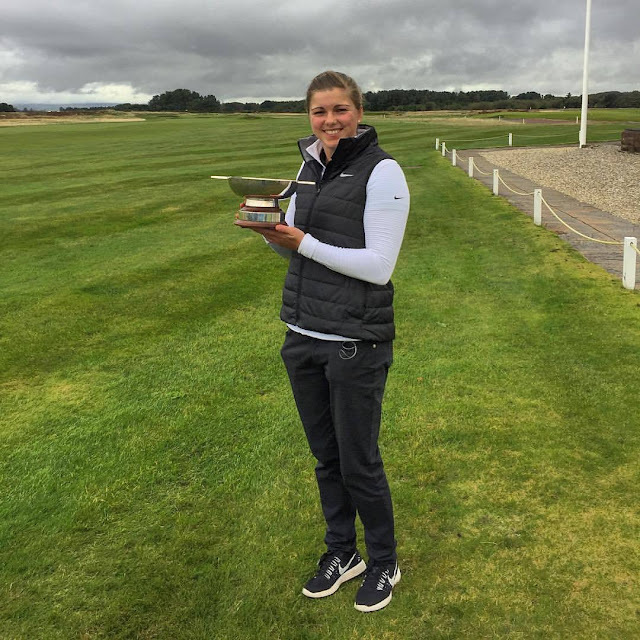 Hannah McCook (Grantown on Spey) won the Scottish women's champion of champions' 18-hole tournament at Glasgow Gailes Golf Club today (Sunday) despite double bogey 6s at the ninth and 10th holes. Birdies at the first, fourth and 14th helped her return a one-over-par 72, a good score for the testing links course. Tara Mactaggart (Minto) finished runner-up, one stroke behind with a 73. Had Tara finished with a par 4 instead of a double bogey 6 she would have won the title. The Borders player started well with birdies at the first, second and fifth but had a bad spell in the middle of the round when she bogeyed the eighth, 10th, 12th and 15th. A birdie at the 14th put her back on track for a possible win but the double bogey at the 18th relegated her to second place. Renfrewshire champion Eilidh Briggs (Kilmacolm) finished third with a 74. A field of 16 was the biggest the competition has attracted in recent years. Glasgow Gailes Golf Club, Ayrshire. 72 Hannah McCook (Grantown on Spey). 75 Gillian Paton (Royal Montrose). 81 Lorna McKinlay (Dunnikier Park), Louise Fraser (Kingsknowe), Alyson McGinnigle (Cowglen), Anna McKay (Crail GS)). 82 Gillian Kyle (East Renfrewshire), Shannon McWilliam (Aboyne). 88 Molly Stewart (Murcar Links). 90 Cara Thompson (Royal Dornoch). Retired: Elaine Moffat (St Regulus) after 9 holes.